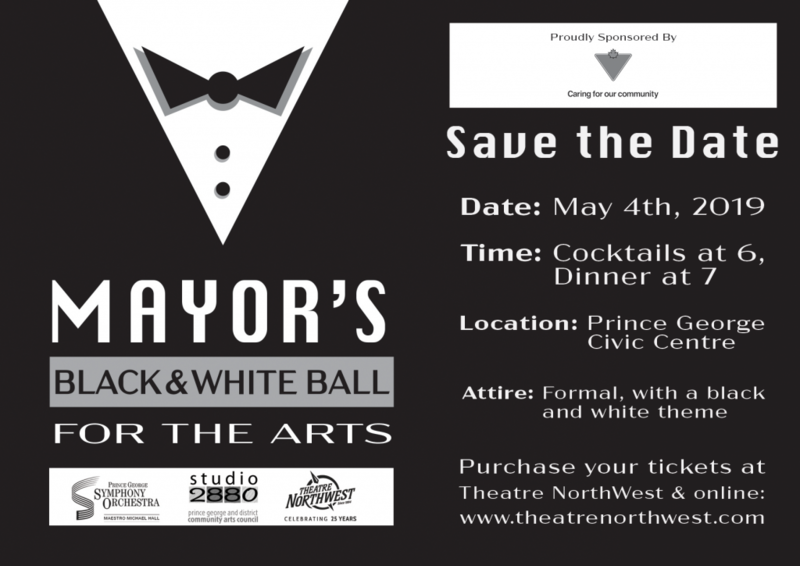 The second annual Mayor’s Black and White Ball for the Arts will be held on May 4th at the Prince George Civic Centre. This one-of-a-kind event is a great opportunity for the community to don their finest attire and come out to an extravaganza event to raise funds for The Prince George Symphony Orchestra, Theatre NorthWest and The Community Arts Council of Prince George & District. This year marks the combined golden and silver anniversaries of the three organizations, totalling 125 years of dedicated service in making Prince George one of the most livable cities in the province! The Black & White Ball is hosted by Mayor Lyn Hall and will feature an exclusive culinary feast, live music, dancing, auctions and other entertainment provided by some of the city’s top performing artists and arts groups. Not only will the funds raised aid the mandates of the three partner organizations, but additional funds will be raised for the Prince George Arts Micro-Grant program which supports local emerging artists by providing funding for short-term arts projects. Interested in being a sponsor of the event? For more information please contact Kim Royle at 250-649-6477 or royle_events@sinkutwireless.ca.